This is the cake that all my practice was about. 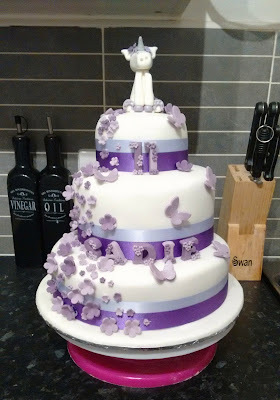 The use of fondant, icing the board, pre-made cake topper and matching flowers by a professional that sells on eBay. The tiers were held in place by invisible dowels to stop it slipping as each layer was laid directly onto the one below. The flowers: I was asked to cascade them down the one side, which looks amazing actually. Inside, I cut out circles from each layer and fitted into the other layer, this makes an interesting finish when the cake is cut. I also needed to colour the sponge. I used gel colouring, which did not work out as well as I'd hoped. Pastes are the way forward. The next cake will have to be pastes. Liquids will change the consistency of your mix, gels just don't cut it, so try pastes.